These wonderful personalized coloring books will bring out your child's creative side, designed with outlined pages for your little one to add their special touch! 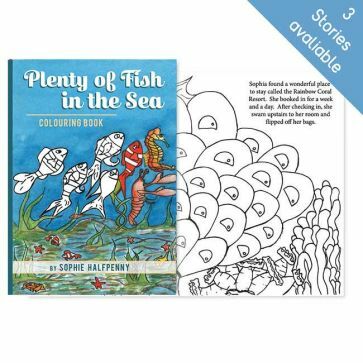 Choose from three coloring books, with a boy and girl version for each. This feisty and fabulous kitten gets a little distracted one day, and finds herself entering a world she had never imagined existed. Written by Jayde Rumoro, illustrated by Abby Johnstone. This excited rooster is looking forward to attending the Annual County Chickie Dance tonight. Join him in his search around the farm for items to wear to help him win the Best Dressed Rooster Trophy. Will he win? Written and illustrated by Grace Leggatt. A little goldfish named (Child's name) lives at the bottom of the ocean. She feels lonely and sad because she can't find a friend down there. Join her as she goes in search of a friend. Written and illustrated by Sofie Halfpenny.